So today Michelle Underwood releases a new kit, That Was Yesterday. 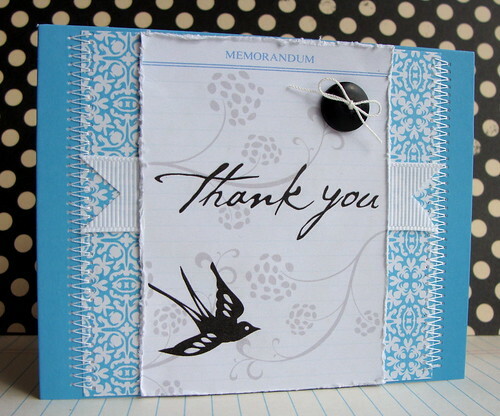 Love this little Memo page, and the gorgeous blue patterned paper. 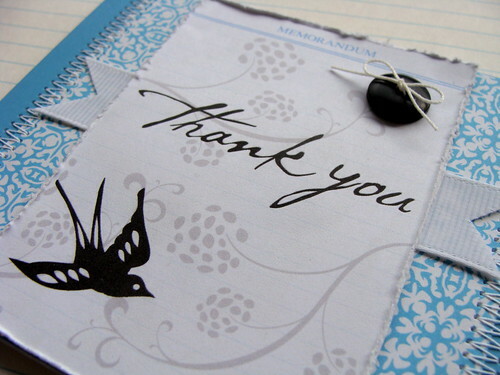 I decided to combine it with some Hero Arts digi stuff to make a little thank you notecard. The swirls and bird are both from Whimsy, a gorgeous HA digikit. And the sentiment is from THIS kit. Such a useful kit for cardmakers. This sentiment is my favourite from the kit - love that font. Lucy, this card rocks! I love the new stamps, and that paper is gorgeous. Great card, my friend! Wow - you are so clever with your hybrid cards Lucy.... Looks like I need some more kits. Gorgeous! Really pretty colors, love the birds in flight! That really is a beautiful blue, Lucy! Love the way you've added the black elements! Such a pretty card! I'm a sucker for swallows and your card is so gracefully beautiful. TFS! So beautiful...I have fallen in love with this one ! wow, I love how the black accents and sentiment really pop on the subtle background of soft blue and white. Seriously gorgeous card! this is so elegant, Lucy! love the shades of blue!